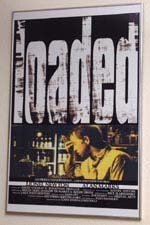 Adapted from Paul Slabolepszy’s theatre production, LOADED tells the story of a man at the end of his tether after having lost his job to an affirmative action candidate and whose wife has just left him. He hijacks a man in a downtown Johannesburg bar - an act which leads to extraordinary consequences. This 18-minute short film premiered at the Southern African International Film and Television Market in 1998 was directed by acclaimed theatre director Lara Foot Newton.